Short-Term Upward Reversal or Just a Bounce? 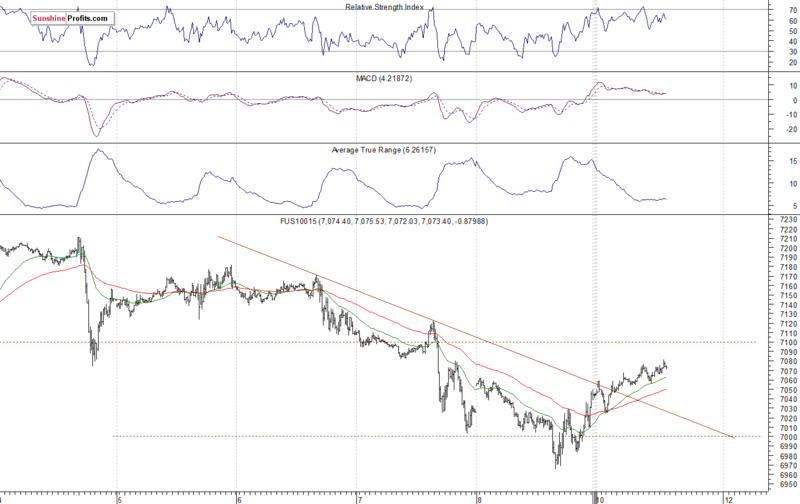 Stocks extended their short-term downtrend on Friday before bouncing off and closing slightly lower. Investors continued to take profits off the table following the two-month-long advance. Is this a downward reversal or just a correction before another leg higher? The U.S. stock market indexes lost 0.1-0.2% on Friday, as investors continued to take profits off the table following two-month-long advance. The S&P 500 index retraced more of its October-December downward correction of 20.2% a week ago, before reversing lower and getting back below the 2,800 level. The market fluctuated close to the previous medium-term local highs and then it retraced most of its February's advance. The Dow Jones Industrial Average lost 0.1% and the Nasdaq Composite lost 0.2% on Friday. 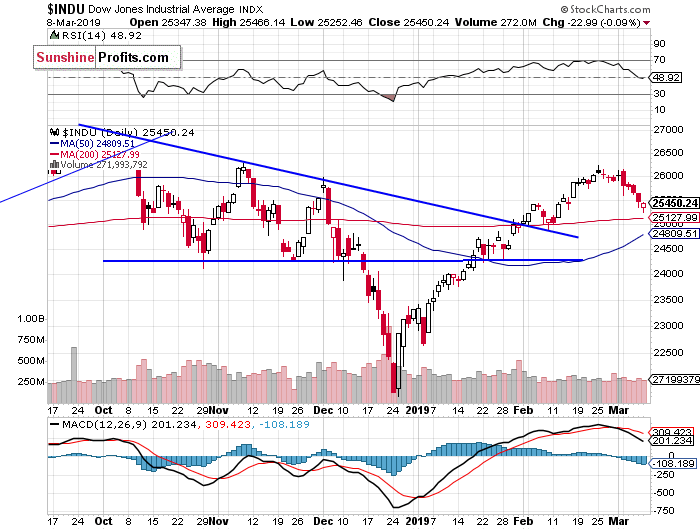 The nearest important resistance level of the S&P 500 index is now at around 2,765-2,770, marked by the Thursday's daily gap down of 2,767.25-2,768.69 and the recent local lows. The resistance level is also at 2,800-2,820, marked by the medium-term local highs. 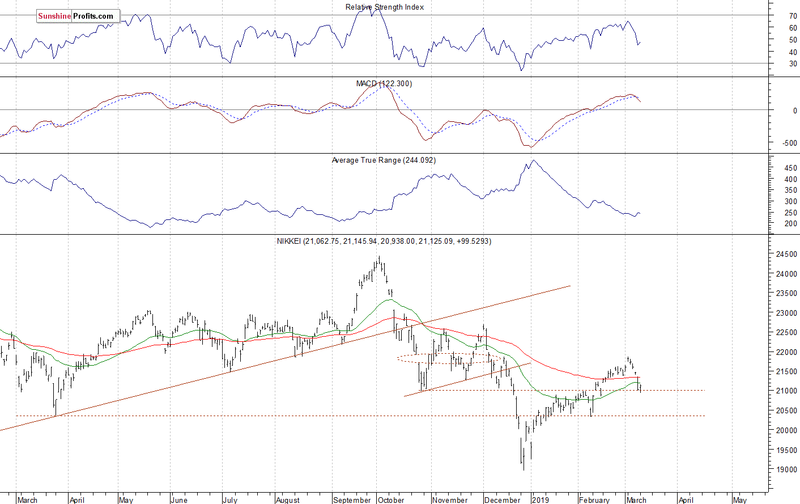 On the other hand, the support level is at 2,730, marked by the mid-February local low. The next support level is at around 2,720, marked by February the 11th daily gap up of 2,718.05-2,722.61 and the Friday's daily low..
Expectations before the opening of today's trading session are slightly positive, because the index futures contracts trade 0.1-0.2% above their Friday's closing prices. The European stock market indexes have gained 0.3-0.4% so far. Investors will wait for some economic data announcements today: Retail Sales number at 8:30 a.m., Business Inventories at 10:00 a.m. 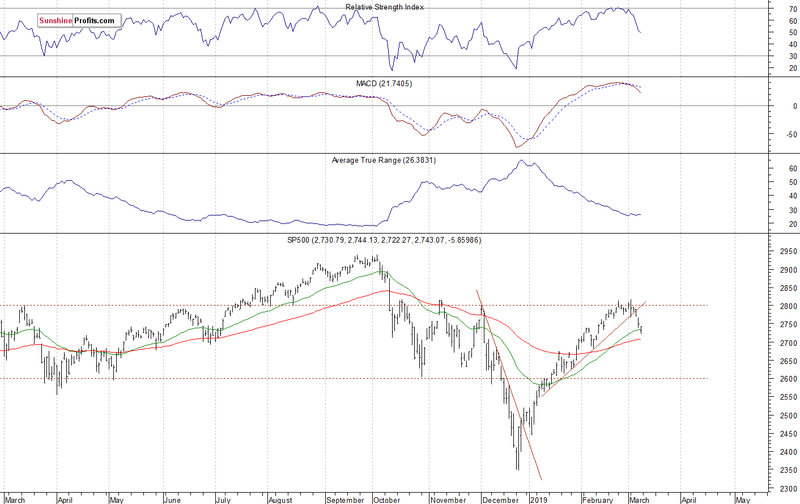 The broad stock market will likely retrace some of its recent decline. However, we may see some more uncertainty, as stocks get closer to their previous local lows. 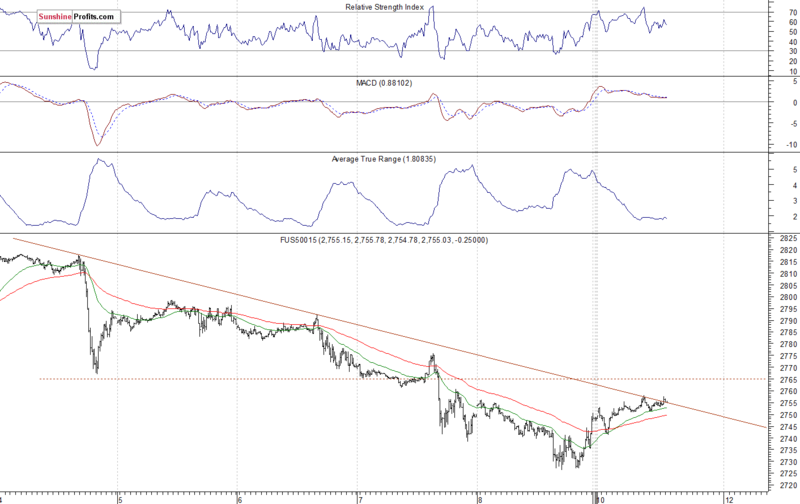 Dow Jones - New Downtrend or Just Downward Correction? The S&P 500 index slightly extended its recent run-up on Monday a week ago, before reversing lower and closing below the 2,800 level that day. 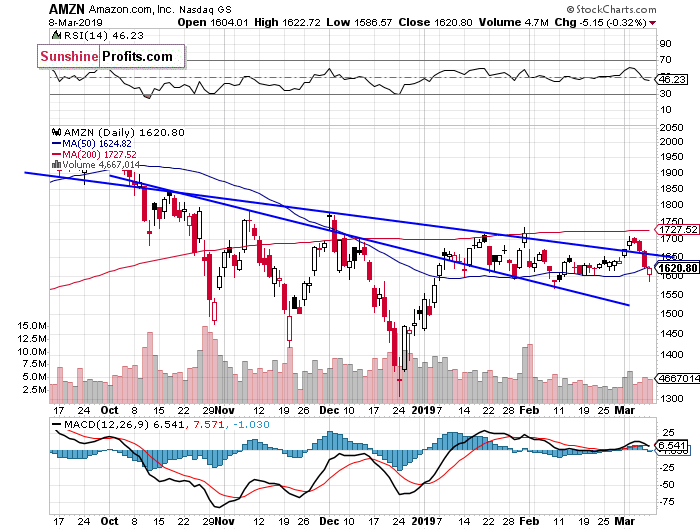 Then it retraced some more of its recent advances and it broke below the two-month-long upward trend line on Thursday. So it bounced off the mentioned medium term resistance level. 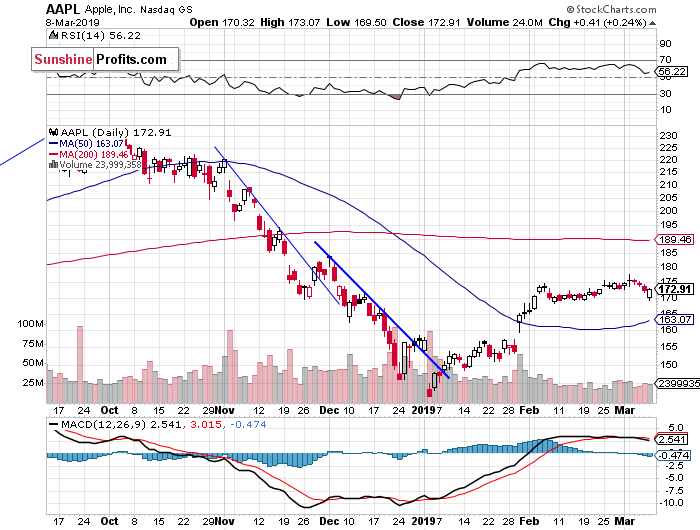 For now it looks like a correction within an uptrend. Concluding, the S&P 500 index will likely open slightly higher today. But we may see some short-term uncertainty following the last week's decline. There have been no confirmed short-term positive signals so far.